Q. 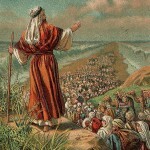 Why do we include the Song of the Red Sea in the daily prayers? A. After the daily Passages of Praise we add this song (Ex. 15:1-21) in praise of God’s redemption of our ancestors from Egypt. It teaches the resurrection of the dead, since it says Moses and the Children of Israel will sing this song in time to come (Sanh. 91b). It tells us to observe the commandments with beauty and splendour, since verse 2 of the song says, “This is my God and I will glorify Him” (Shab. 133b). It shows that even the supposedly least person is precious to God, since the sages say that at the Red Sea even the lowliest servant girl experienced prophetic spirituality (Mechilta). The prayer book says that the people sang the song “in great joy” because of the exhilaration of the moment, though the “high” did not last and shortly after leaving the Red Sea the people began grumbling. This entry is filed under Ask The Rabbi, Bible/Tanach, Prayer.